Greetings from The 88 Project! We are bringing you news, analysis, and actions regarding human rights and civil society in Vietnam during the week of August 6-12. Two activists face trial in the coming week, political activist Le Dinh Luong on August 16, and Brotherhood for Democracy member Nguyen Trung Truc on August 17. Political prisoners Nguyen Van Dien, Vu Quang Thuan, and Vu Van Hung have all been transferred to new prisons. Female prisoners jailed for their participation in the nationwide June 10 protests are facing intimidation in prison. This week, we bring you the second translation of a series of letters from imprisoned writer and entrepreneur Tran Huynh Duy Thuc. We also bring good news that land rights activist Tran Thi Thuy was released to her hometown after completing her eight-year sentence this week. Nguyen Van Thien, also a land rights activist, was due to complete his prison sentence this week as well. We also remembered political prisoners Truong Minh Duc and Nguyen Bac Truyen on their birthdays; they are both serving more than ten years in prison for their peaceful activism. Blogger and co-founder of Vietnamese Women for Human Rights, Huynh Thuc Vy, was detained for 15 hours this week and is now under police investigation and a travel ban. An unruly group targeted blogger Nguyen Lan Thang’s home this week, trying to confront him about his activism. A rare screening of a documentary featuring Nguyen Ngoc Nhu Quynh (Mother Mushroom) and her family drew a large crowd in Nghe An province, an area frequently targeted by authorities for its connections to religious freedom and environmental advocacy. And rights groups have demanded that Vietnam look into the suspicious circumstances surrounding Hua Hoang Anh’s death last week after police questioning. In the news and analysis section, read an opinion on why Vietnam’s new Cybersecurity Law is harmful to economic growth, and learn more about the Congressional and community efforts to release US citizen Michael Nguyen, who was detained in Vietnam while vacationing. Please consider donating to our crowdfunding campaign to support female political prisoners and activists and bring their courageous stories to a larger audience. After his July 30 trial was postponed, political activist Le Dinh Luong (left) will now face trial on August 16 in Nghe An province. The veteran has participated in environmental activism and called for an election boycott. He was finally allowed to meet with his lawyers in late July, after a year of incommunicado detention. Brotherhood for Democracy member Nguyen Trung Truc (right) will go to trial one day later in Quang Binh province. It is not clear if Truc will be able to meet with his lawyer prior to trial. A source close to the family has reported that Truc is having problems with his eyesight and is generally in poor health. Political prisoners Nguyen Van Dien (left) and Vu Quang Thuan (center) have been transferred to new prison facilities. Dien was transferred to Prison no. 5 in Thanh Hoa province from Hanoi Police Detention Center No. 1, 400 km from his family, and Thuan was transferred from Hanoi Police Detention Center No. 1 to Ba Sao prison in Ha Nam province. The two and their co-defendant, Tran Hoang Phuc (right), plan to appeal to the Supreme Court after their sentences were upheld on appeal. All three are affiliated with the National Movement to Revive Vietnam. Thuan is serving an eight-year sentence, Dien six and a half years, and Phuc six years. Thuan and Dien were accused of posting 17 video clips on the Internet and possessing materials with anti-socialist state content; Phuc was accused of helping them in storing the materials and posting three of the 17 clips. Pro-democracy activist Vu Van Hung has also been transferred to a new prison. He has been moved to Prison No. 3 in Nghe An province, about 300 km away from where his wife lives. He is serving a one-year prison sentence for “deliberately causing injury,” which many believe was motivated by his activist background. Female prisoners are facing intimidation in prison after Vietnam jailed fifteen more people last week in connection with nationwide protests. The fifteen were sentenced by a court in Bien Hoa city to periods ranging from eight to eighteen months in prison for participating in June 2018 protests. Female prisoners who have sought to appeal their sentences have been threatened against doing so. Imprisoned writer and entrepreneur Tran Huynh Duy Thuc has written a series of letters home to his family about prison life and his thoughts on current events. In the second of a series of translations, Thuc writes about the need for open and innovative global economic systems, saying: “…in order to possess superior technologies, the nation must be a society in which ideas and activities flow freely to create a free competitive environment.” If you missed the first letter of the series, read it here. Land rights activist Tran Thi Thuy (above) was released from prison this week. Thuy, a Hoa Hao Buddhist, was arrested on August 10, 2010 and later sentenced to eight years in prison. She suffered from a tumor while imprisoned, but was often denied medical care. She became an advocate for those affected by land grabs after she herself became a victim of land confiscation. She was released on August 10 and taken to her hometown in Dong Thap province. 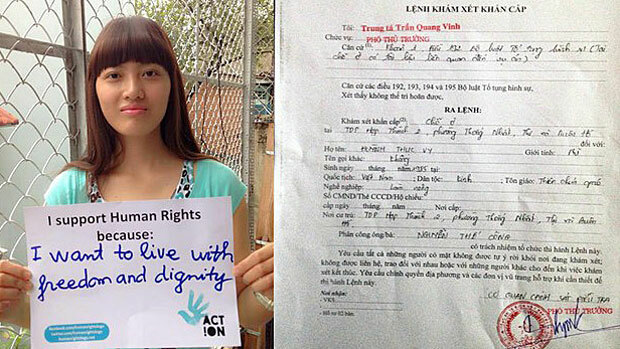 On August 6, 2014, land rights activist Nguyen Van Thien was arrested and later sentenced to four years in prison. He was due to be released from prison this week as well, but we cannot confirm the release. We remember political prisoners Truong Minh Duc (left) and Nguyen Bac Truyen (right) this week on their birthdays, August 10 and 12, respectively. Duc is a pro-democracy journalist serving 12 years, and Truyen is a religious freedom and human rights activist serving 11 years. A rowdy group surrounded blogger Nguyen Lan Thang’s home this week, insisting Thang speak with them about his activism, but he was not home at the time. Police were informed but did not investigate at the scene. The group eventually dispersed, but vowed to return. Thang is a member of No-U FC soccer group, which protests maritime sovereignty issues, as well as a writer for Radio Free Asia. A Catholic church in Nghe An province screened a documentary about imprisoned blogger Nguyen Ngoc Nhu Quynh (Mother Mushroom) and her family. Vietnamese officials prohibited the film, called “When Mother’s Away,” from being shown at an event in Thailand recently. The event in Nghe An, however, drew a crowd of 1,000. Hua Hoang Anh, a farmer from Kien Giang province, died after being questioned by police last week regarding his participation in the nationwide June 10 protests. Police announced his death as a suicide, but many questioned this, as Anh had sustained injuries on his neck and head. Amnesty International and others this week called for an independent investigation into Anh’s death. Thanks to your support, we have made it to 10% of our goal for our crowdfunding campaign: Run for Vietnamese Activists! The campaign is raising funds to produce video interviews with female activists at risk and former political prisoners. There are currently at least 15 female political prisoners in Vietnam. And even more are facing increasing harassment and physical assaults, like writer Pham Doan Trang, a leading figure of the Vietnamese democratic movement. Follow us on Twitter @The88Project and on Instagram for the latest updates on the campaign, and please donate here to help us reach our goal!